Our book club is currently reading this little gem of a book. It’s like a bowl of your favorite ice cream – every single sentence must be carefully read, held for several seconds, rolled around, and then swallowed and on to the next bite! It is a deep calls to deep reading experience and I am not even finished with the book. It’s that bowl of favorite-flavored ice cream that I just want to keep scooping out to get the next taste delight. This morning I savored chapter seven and it may prove to be my favorite of the book – time will tell. Ms. Voskamp has a unique writing style – some may find it difficult to read, like a poem with a strange cadence. But, once you get the rhythm – it is a balm to your soul. Starting this book, this afternoon. Looking forward to deep and ice cream! Sandy glad you posted – it’s funny because I started a “Grateful Journal” the beginning of the year. Someone had blogged about doing a journal on the Hope for Women site and I thought what a great idea so I began. 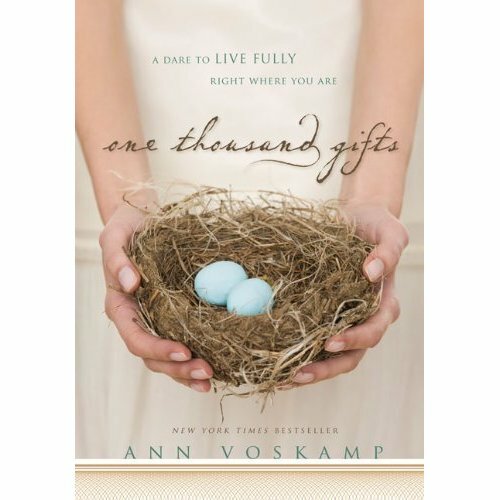 Now, reading this book I realize it’s exactly the same as what Ms. Voskamp is doing on her journey. I try to write in mine at least five mornings a week – I believe I have nearly 300 entries already! Like you, I am grateful for so many, many things. We are blessed!